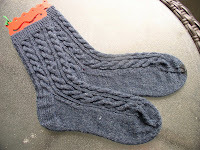 Lorrie knits and sews: The socks are finished!! After finally getting the heel flap correctly centered, and on the correct number of stitches, I had to turn the heel. It took 3 tries!!! Part of the problem was splitty yarn. It took more concentration than usual, but after that, it was clear sailing until I reached the toe, and the end of the yarn! I raveled the toe of sock #1, removing about 1/4". Finished sock #2, and went back to sock #1. I almost made it. Yes both socks are a little shorter than planned. Socks stretch. I finished the sock with some charcoal yarn of the same brand. I never thought that with a 459 yard ball of yarn I'd run short. Those 84 stitch legs eat up the yarn. Next up is a July 5 birthday. I've started those and they will be simple. One of the sock Knitters Anonymous challenges for June is to design your own. I'm recycling a pattern I used for DH. I knit his in a sport yarn and never published the pattern. This time its navy sock yarn. I also have a July 18 birthday and 2 more later in the month. I'm not sure they all will get socks, even belatedly. I'm teaching 2 classes Sunday at Lake FarmPark wool fest. Cables and two-hands two colors. Should be fun. I'll try to take photos at the event. Wow, you are a productive sock knitter...what fast work you do! I never saw a purple cow..
Shawls and socks and more.